Reports in Italy claim that Rafa Benitez either has been sacked by Inter or is about to be given the boot in the next 48 hours. Recent comments by Inter chief Massimo Moratti suggested that Benitez was a dead fat waiter walking, and not even victory in the Club World Cup – a hollow victory anyway, in a hollow tournament – can save the Spaniard; there are even reports that he has returned to his home in Liverpool. Memo to all managers: never occupy an office recently vacated by Jose Mourinho. It’s an impossible job. Rafa for Blackburn Rovers anyone? Don’t laugh, it could happen. @Greg I second that. YNWA, Rafa. please come home Rafa !! Maybe a more likely landing spot would be West Ham…Grant’s days are numbered, and Rafa sense of humour won’t play any better with The Chicken Gang, than Big Sam’s did…..priest on an mountain of sugar and all that. 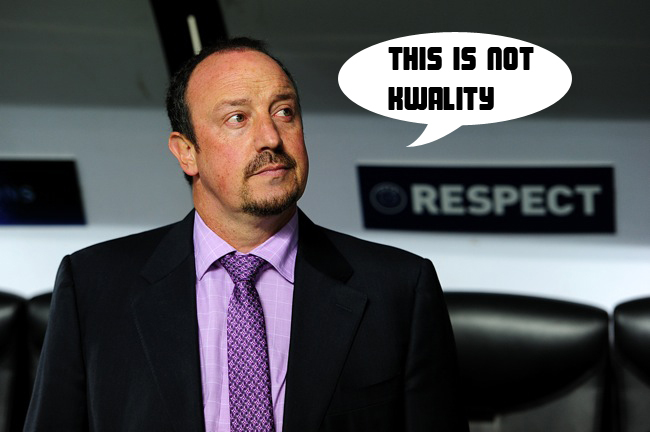 What now for Rafa? Back to Spain it is.